MiniRF is a new name for a passive component company with over 20 years of design and manufacturing experience. The company was originally formed by PDI (Premier Devices Inc) in the early 1990’s, was acquired by Sirenza Microdevices in 2006 which in turn was aquired by RFMD in 2007. MiniRF has returned to its roots, focusing strictly on passive components. MiniRF is dedicated to providing quality RF passive components at competitive prices for existing and emerging Broadband/CATV and Wireless Communications Systems. 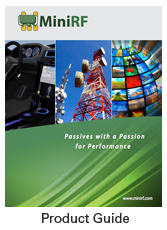 MiniRF is a proven leader in supplying high performance surface mount passive components. MiniRF components are found in the products of many of the world’s largest suppliers of communications products with nearly a billion units shipped. MiniRF designs and manufactures both standard and custom transformers, couplers, splitters, mixers and chokes. We specialize in delivering quality surface mount passive components and devices. A ferrite core is found in almost every MiniRF product. The performance of MiniRF’s product depends on the magnetic properties of the core and its interaction with the wire wrapped around it. Winding cores is a specialized manual process and therefore labor intensive. RF performance will vary with minor differences in how the wire is wound to the core, so careful attention to manufacturing detail is documented from sourcing materials all the way through testing. All MiniRF manufacturing facilities are ISO9001 certified. 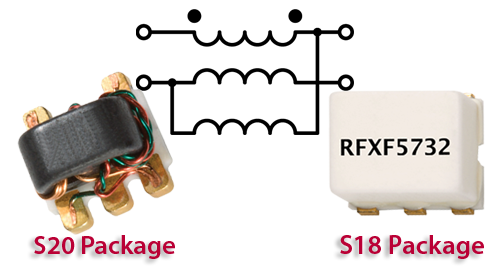 MiniRF, RF Component Manufacturer in Silicon Valley, Provides Surface Mount Transformers, 3 Way Splitters. 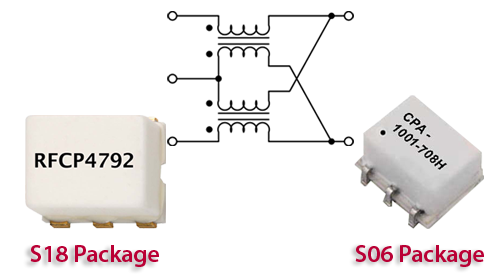 We also provide surface mount balun docsis 3.1. The market for wire wrapped ferrite based RF components is very competitive so attention to material cost and tight management of our processes are important. The management team understands this and is committed to deliver volume quality products at competitive prices. Copyright (c) 2016 MiniRF Inc. All rights reserved.